Good day people of the blog and social media world, this is Brent with a special tech post from a recent New York trip to go see Creative Tech Week. 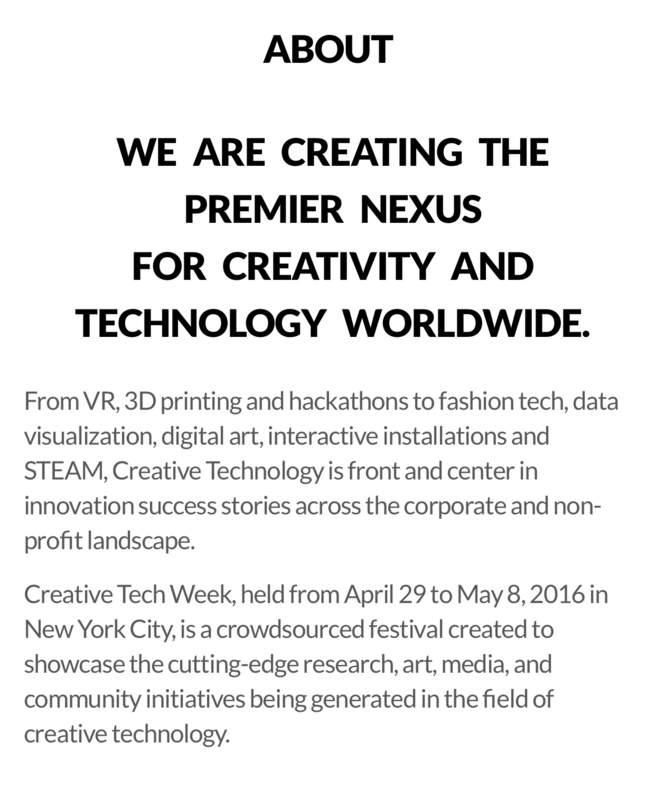 Now first of all what is Creative Tech week and what is its purpose? Now that we have that information let me tell you that to a guy like me I was in heaven. All the technology, influence, and knowledge in one place was a mind blowing experience. I not only the ability to discuss new products and ideas with artists and designers but the chance to try on some of the best and newest VR tech. During my visit there was some applications of VR that really stood out to me Bella Gaia, Splash Pool, and Foo/skou. As defined by others –BELLA GAIA is an unprecedented audiovisual experience that combines NASA satellite imagery of Earth, time lapse nature photography, and cultural heritage footage with stirring live performances of music and dance from around the world (www.bellagaia.com/about). As defined by me– Bella GAIA is beautiful sight, sound and places in one culturally inclusive performance. I haven’t been moved like this in many years of seeing audio visual performances live and online. It was as close to visual and audio harmony as I can remember. Why did this experience blow me away? As humans look for new ways to be entertained and new ways to consume media, it came to no surprise that virtual reality technology was the next step in this on going search. Bella Gaia is an amazing experience in person and even peaked my interest through its website and various youtube videos but there is a diffeniate disconnect between live and at home viewing performances. With the newest component of Bella Gaia VR that live component is almost there, and I found myself almost forgetting that there was headset on. I was fully immersed into a world of colors, pictures, places, and many beautiful sounds. The ability to experience a concert like event through VR makes you immediately question all other media that you have viewed on standard Youtube, Vimeo, or other video hosting websites. The best part of the VR headset is that the user can move his head, neck, and eyes all around as if they were actually there in the concert hall. This changed my opinion about VR as I felt that just hearing music with some basic visuals would never really catch on but with this new element, the gimmicky feeling isn’t there. I found myself believing I was really there! He is a composer and director for multi-media live theater, immersive fulldome planetariums, and interactive data visualization (www.kenjiwilliams.com). That is a lot to say and he is quite an accomplished man with a resume that we could talk about for hours. The one thing that I took away from my quick interaction with Mr. Williams is that he is passionate about his project. He discussed with me plans for it to continue to grow and expand in the near future with some locations closer to my home of Baltimore, MD. I look forward to keeping in touch with Mr. Williams and experiencing the evolution of Bella Gaia and other projects that he will work on over the years. This use of VR is certified fresh and exciting and will only help further the VR movement for years to come!